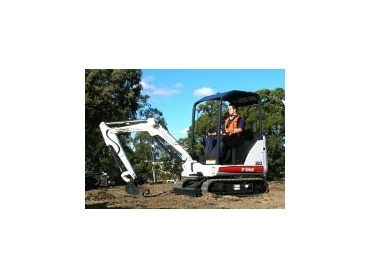 Bobcat Australia introduces the new 323 Compact Excavator. The Bobcat 323 has a digging depth of 2,297 mm and a maximum reach of 3,912 mm at ground level. This extra reach enables contractors to reach farther and dig faster with minimal re-positioning. In addition, the Bobcat 323 compact excavator's two-speed travel motors and new hydraulic system will appeal to the construction industry because the features provide increased travel speed and improved control while digging. Equipped with a new hydraulic system that features a piston pump, the 323 is able to maintain constant digging forces by minimising lugging. The system's torque-limiting piston pump senses and reacts to hydraulic loads, resulting in better utilisation of the engine's torque curve. The two-speed travel motors provide a 2.3 km/hr low travel speed and a 3.8 km/hr high travel speed, increasing the machine's mobility around jobsites. The turf-friendly rubber tracks distribute the operating weight of 1,658 kg of the excavator over a larger area to lower ground pressure to 28.4 kPa which minimise damage to landscapes, paving stones, and other established surfaces. Steel tracks are also available for harsher working environments. With a retracted width of 980 mm and with the tracks expanded to 1,346 mm., the 323 is able to access and work in confined spaces. The 323 offers 30 L/min of auxiliary hydraulic flow and is powered by a liquid-cooled, 9.9 kW, Tier II diesel engine. Ideal for demolition and landscape applications the 323 can be attached with a hydraulic breaker, hydraulic clamp, auger or grading and trenching buckets. Maintaining the company's reputation for excellent compact equipment, the new 323 has industry-leading features, such as hydraulic joystick controls, an extra-wide rear door opening, and an optional enclosed cab with heater.